The benefits of belonging (in terms of debt support given via ECB QE) have risen, while the disadvantages of being outside – as has been seen in countries like Denmark, Sweden and Switzerland – have also grown. This is not a complete cost/benefit balance sheet, but a limited exploration of just one area. That being said it is an area where exploration may help those who simply can’t understand the recent determination shown by the Greeks to maintain their Euro membership, a determination which I think is difficult for those in London or the US (who are using a traditional deleveraging and monetary policy framework) to understand. 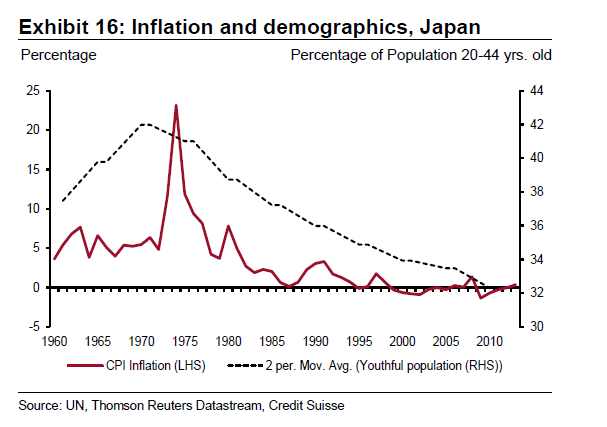 iii) Since the problem is demographic central bank quantitative easing will not generate long term and sustainable inflation. (See Maasaki Shirakawa: Is Inflation (or Deflation) “Always and Everywhere” a Monetary Phenomenon? I would argue that my assumptions are both realistic and plausible, and of course have the advantage that they can be readily falsified, by the BoJ or the ECB being eventually able to “normalize” interest rates, for example. (On this see Larry Summers, “will there room the next time we have a downturn for a 4% point decline in rates?“). Such assumptions paint one possible scenario which is, if you like, my baseline case. This scenario may not be realized, but can economic and policy agents afford to ignore the possibility that it will? And if it does turn out to be confirmed by a rapidly changing reality, would this not change how we should think about Euro membership before recommending to countries like Greece to either stay or go? Greece is a clear case of what I am talking about, since its current 175% of GDP government debt level has been reduced to a convenient “fiction” (with little in the way of real cost to the country) backed by the appropriate accounting framework which satisfies various national parliaments and confuses rather than enlightens the average layman. Further, if Greece eventually qualifies for ECB bond purchases then this “debt for free” component will only be consolidated. But here I do not wish to dwell further on this aspect of the situation, rather I’d like to look at the impact of having only a mid-size central bank at a time when a large neighbour (the ECB) is about to embark on a sizable QE programme. While countries like Switzerland and the UK saw their currencies appreciate during the existential Euro crisis due to their “safe haven” status, what is happening now is a quite different phenomenon. In the first phase money was fleeing the currency union fearing conversion risk, now it is being driven out by an explicit policy of the central bank. At the very same moment Greece was being pushed near to the point of introducing capital controls to stop capital flight, Denmark was rumored to be near to introducing them to stop capital inflows. 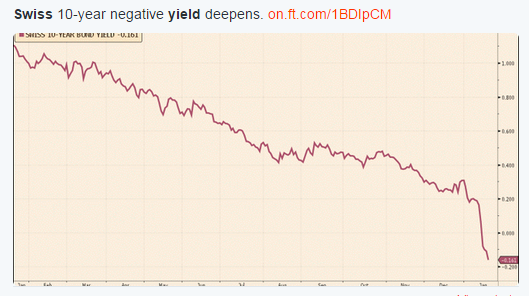 The build-up towards ECB QE is the essential backdrop to all this. The ECB is implementing a policy which is intended – however much the bank denies they target any given currency level – to make the Euro weaker, based on the idea that this should stimulate growth by encouraging exports, and raise inflation by making imports more expensive. This is the process we have seen at work in Japan. One of the main channels through which QE achieves this effect is via the so called portfolio effect. The central bank action (or even the promise of it) lowers yields on the bonds since they become virtually risk free and it is going to purchase, making them less attractive for investors. Faced with this, and with the fact that as the Euro weakens the USD value of such investments weakens, the hope is investors offload the bonds they have in their portfolio to the ECB and put the money freed up to use elsewhere. In fact the bank even introduced a negative deposit rate for those commercial banks storing money in its vaults to try to induce this effect. 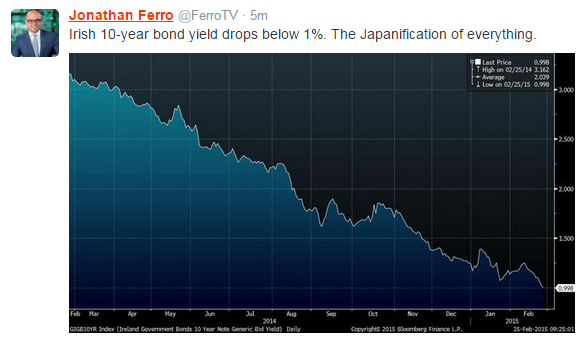 And it wasn’t only the 10 yr bond, those of shorter duration went to ever lower levels. 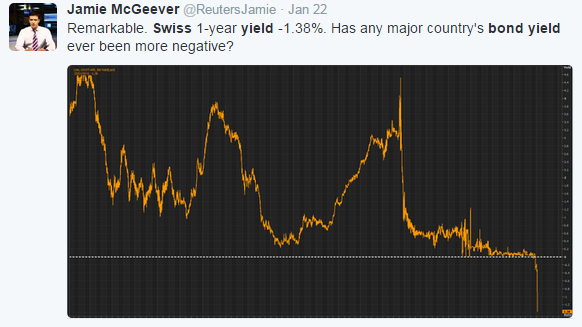 On the 22 January the 1 year bond yield hit -1.38%. 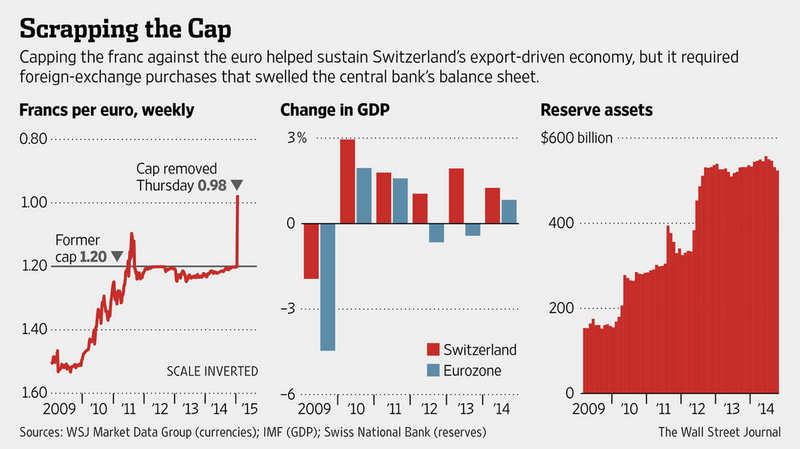 Seeing the havoc – and trading opportunities – that were created in markets by the Swiss Cap removal investors did not need much convincing to put themselves to work looking for other possible “volatility” candidates, and it didn’t take them long to stumble upon the Danish Krona’s peg with the Euro. In the first place, and despite having an already over-leveraged household sector, you can get paid in Denmark to take out a mortgage (and here, in Danish). Danish households owe their creditors 321% of disposable incomes, according to the Organization for Economic Cooperation and Development. “That’s the highest ratio in the world and a level that’s prompted warnings from both the OECD and the International Monetary Fund to rein in borrowing. Danish authorities have argued that households aren’t at risk thanks to high pension and household equity levels”, according to Bloomberg. Meanwhile, even years after Denmark’s property bubble burst, house prices in the country’s biggest cities are already higher than at any point in recorded history. Another unusual result of the policy is that commercial banks are now starting to charge retail customers negative interest on their deposits. In times of negative lending rates “paying our customers zero or positive interest is very bad for profitability”, Palle Nordahl, FIH Erhvervsbanks chief financial officer, told the Wall Street Journal. 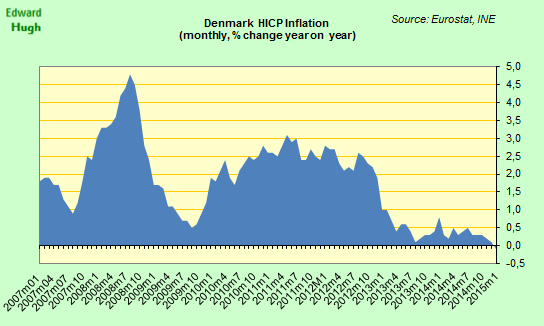 Denmark is itself experiencing very strong disinflation and the central bank is clearly concerned lest this becomes outright deflation, yet breaking the peg and floating would see the currency pushed up, not down as the country needs. 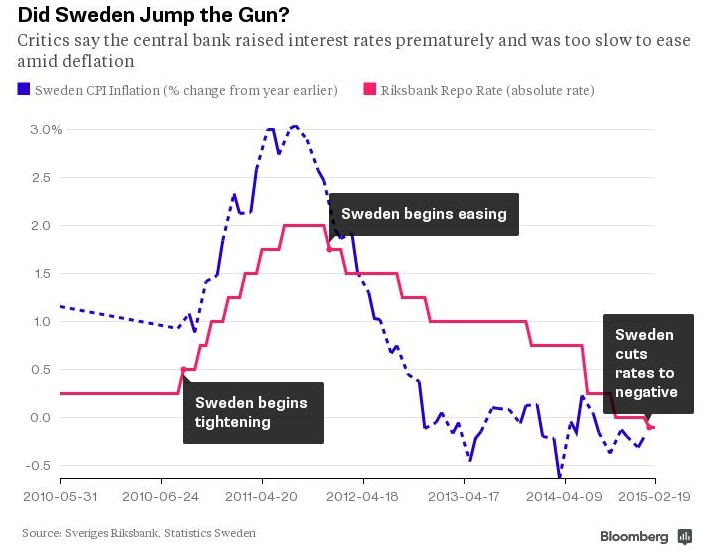 On 11 February the Riksbank, the very selfsame one that Paul Krugman had referred to as “sado-monetarist” for its 2010/11 rate hikes, surprised everyone by announcing it was cutting its benchmark rate to minus 0.1%. 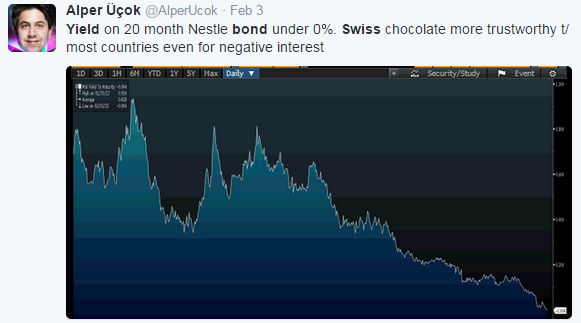 At the same time the bank announced a QE style programme of bond purchases. 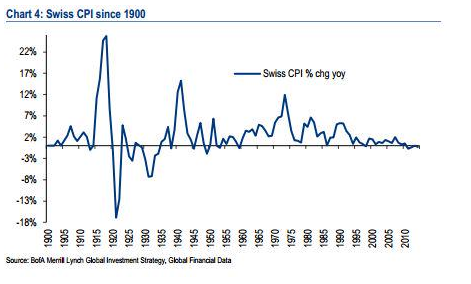 In fact, those looking at what had been happening in Switzerland and Denmark should not have been so surprised: bets the country’s currency would rise had been increasing at the same time as the country was sinking steadily into deflation. 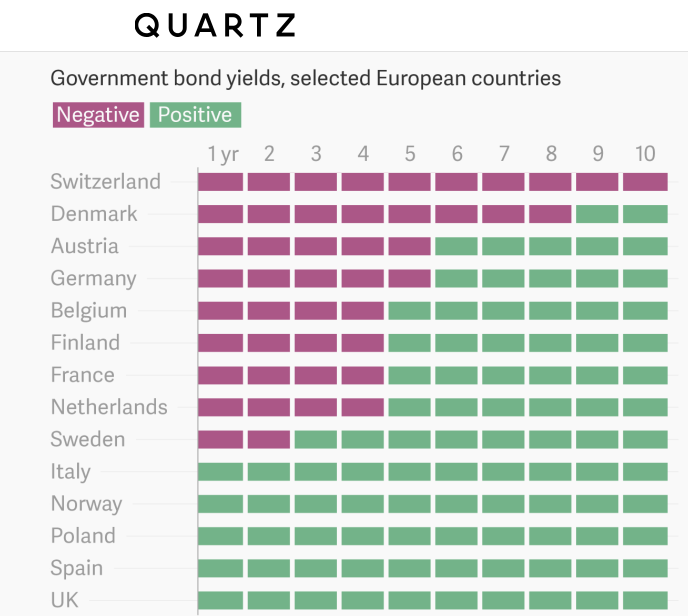 No other central bank has maintained a negative deposit rate as low as the Riksbank has. The bank reduced the rate for commercial banks to -0.85% in Feb after having maintained it at -0.75% since October 2014, just to keep one step ahead of the Danes. 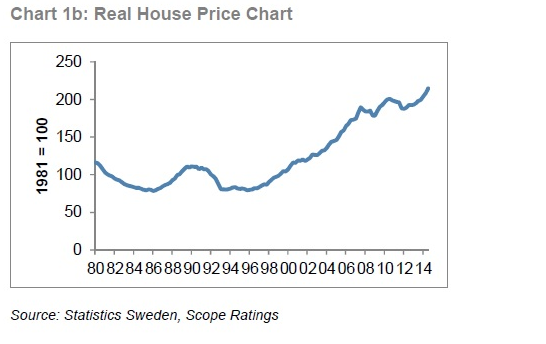 What makes the Swedish case such an striking one is that the economy is growing quite rapidly – it was up 1.1% q-o-q in Q4 2014, and by 2.7% y-o-y – and the housing market is booming. Credit growth was an annual 6.1% in December, while house prices in January were up 9% over a year earlier. And Sweden comes second only to Denmark in an international comparison, with mortgage debt running at around 80% of GDP. Yet such is the fear of what the backdraft from ECB might be that policymakers felt they had little choice but to go for what they clearly see as the “lesser evil”. In particular financial globalisation and mass migration flows have significantly changed the environment in which monetary policy operates. One of the first to draw attention to the way things were changing was the Danish economist Carsten Valgreen who coined the expression Global Financial Accelerator in the pre-crisis years to describe one of the most important of the new phenomena. Simply put normal standard interest rate policy had been weakened by the growth of non-linear currency effects. This point has still not gotten home to many policymakers, a reality which was underscored by a recent interview given by the OECD’s chief economist, Catherine Mann. “It’s actually strange that there’s such a pressure for appreciation,” she told Bloomberg’s Peter Levring when asked about what was happening to the Danish Krona. “The economy isn’t that strong, it’s not very different from the euro area, so demand for appreciation shouldn’t be that strong,” she went on to say. It shouldn’t be, but it is, and this is hard to understand using conventional models, although as we have seen it is perfectly comprehensible and even predictable. It’s the forex factor that dominates yields, and if the peg breaks and the Krona spikes upwards as the Swiss Franc did there is plenty of money to be made by holding Krona denominated assets. Since the ECB is a lot bigger and a lot stronger there is little downside risk, and in addition Denmark is rated Triple A. And this situation is not new. Already in the early years of this century Valgreen was drawing attention to just how powerless national monetary policy had actually become, especially in small open economies, in a world of fluid cross-border financial flows. The thought involved is really quite straight forward: real economic decision makers are increasingly insulated from local monetary conditions and more sensitive to global ones and transnational credit extension willingness (or, if you prefer, global risk sentiment). 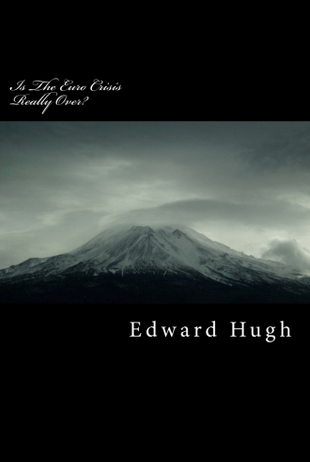 In order to illustrate his point he selected two countries – Iceland and Latvia – both of which were later to gain a certain degree of notoriety. As it turned out neither the Icelandic nor the Latvian central bank were able, using simple recourse to conventional monetary policy tools, to control the rate of credit extension in their countries. The end result in each case was surprisingly similar, despite the fact one had a free floating currency and the other was on a peg. Thus the world of international macroeconomics has changed mightily over the last decade, and things are far from being what they used to be. Which should give us all some serious food for thought when it comes to arguing in favour of a simple return to the status quo ante in the case of the Euro Area countries.It should also help those living outside the Euro Area who to understand the strong desire shown by voters in Greece and elsewhere to stay in EMU despite all the evident disadvantages. On a worst case scenario Greece could become another Serbia, an outcome few either in Greece or outside would wish on the country, but on the best case one it would become a Denmark or a Sweden, with its monetary policy and its currency value essentially determined elsewhere. They would most definitely not be getting the ability to determine their own future since the days when international capital movements were characterized by simple models like Krugman’s eternal triangle are now long gone.